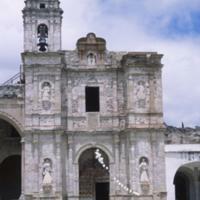 The façade of Teposcolula, with its clear two-level arrangement, the classicized columns, inset niches in the bell towers, was certainly inspired by European examples or other churches in New Spain. The figures, not sculpted in the round but carved in high relief from the niche, were likely the creation of a Mixtec sculptor. 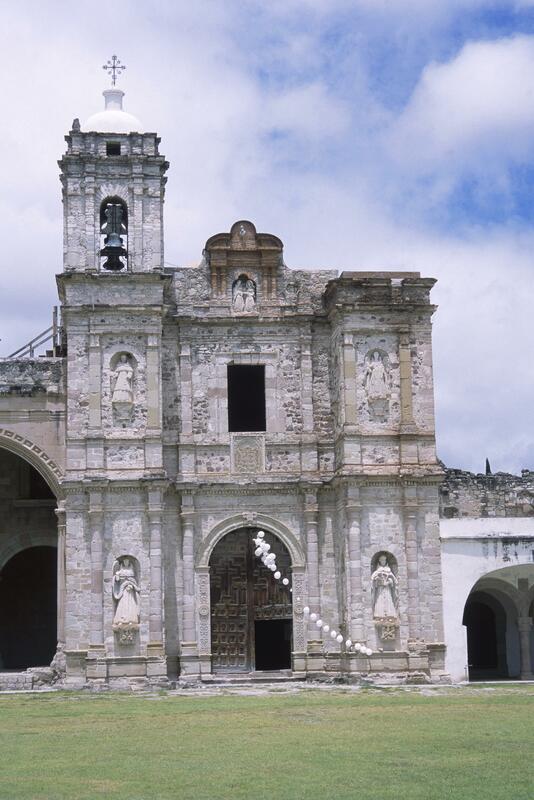 Like many indigenous communities in Mexico, Teposcolula was relocated in the 16th century under the mandate of friars (Dominicans in this case). The original church, again like many from this early date, has been altered over the centuries—although some 16th century elements of the façade remain, including low relief carvings of butterflies and other images which, in contrast to the saints, more likely had their origins in pre-Hispanic practice and belief than in Christian Europe. Ibarra-Sevilla, Benjamin. 2013. "The First Ribbed Vaults in the Americas: Craft Skills and Construction Processes in the Mixtec Region of Southern Mexico." Construction History 28 (1): 1-25. Kirakofe, James. 1995. “Architectural Fusion and Indigenous Ideology in Early Colonial Teposcolula.” Anales del Instituto de Investigaciones Estéticas XVII, 66: 45-84. Mullen, Robert. 1998. Architecture and its Sculpture in Viceregal Mexico. Austin, Texas: University of Texas Press. Terraciano, Kevin. 2000. "The Colonial Mixtec Community." Hispanic American Historical Review 80 (1): 1-42.